Is your contracting business dominating your time? Are you constantly looking for ways to lower your costs, increase your revenue or streamline your operations? Simply put, is your business providing the results you desire? EGIA offers contractors all the tools they need to run or grow a successful contracting business, while freeing up your time and money and giving you your life back. EGIA membership includes access to world class contractor educational programs; cost-cutting discounts and rebates on products and services you use daily; exclusive industry leading financing offers; new actionable industry research delivered monthly and more! 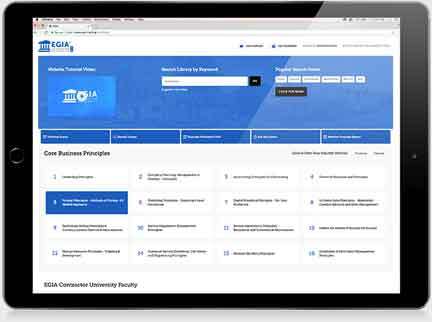 Discounted Premium Membership for VIP Contacts of EGIA Contractor University Faculty Members: $399/Month – A $100/Month savings! Dedicated online classes focused on the fundamental areas of running a contracting businesses. Classes are available on Sales, Financial Structure, Pricing, Marketing, Operations, Customer Service, Service Agreements, Leadership and more. The online classes feature high definition streaming videos and a learning management system that requires all participants to demonstrate their total comprehension of the various lessons, each step of the way, before progressing through the rest of the training curriculum. The Contracting Best Practices Online Library allows member contractors to take an even deeper dive and expand their knowledge, beyond what is covered in the online classes, to achieve total mastery of all the critical areas for running a contracting business. With this powerful resource, you’ll unlock a vast library of high definition training videos, implementation tools, templates, articles and self-evaluation scorecards to support your continued education and business growth. 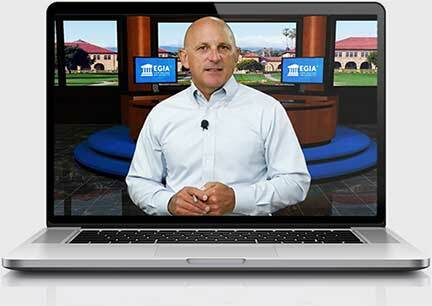 In response to overwhelming demand, EGIA Contractor University leads a Q&A conference call session every other week for premium members that gives contractors direct access to Contractor University's award-winning faculty. These calls allow contractors to ask the burning questions affecting their businesses right now and get immediate answers from the industry's top experts. One- or two-day in-depth educational events focused on the 10 core areas of curriculum provided through EGIA Contractor University. 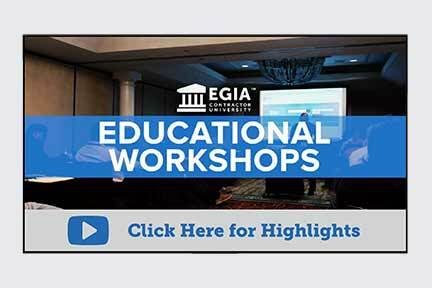 Workshops are One- or two-day in-depth educational events focused on the 10 core areas of curriculum provided through EGIA Contractor University. Workshops are presented in-person throughout the country at one of EGIA’s training hubs typically during non-peak seasons. Premium members receive 2 free registrations to each workshop. Additional registrations for premium members are $199 for a one-day workshop or $299 for a two-day workshop. The registration price for non-premium members is $599 for a one-day workshop or $999 for a two-day workshop. Strategic, business building event featuring headliner keynote presentations, focused breakout sessions, networking opportunities, vendor exhibits and more. This is the can’t-miss event of the year for members. 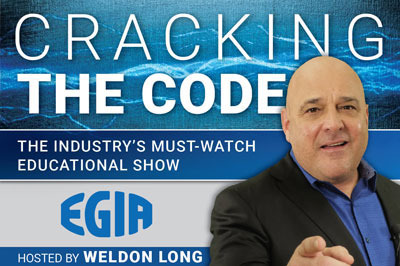 EGIA’s "Cracking the Code" is a weekly show that casts a light on the most important topics related to running a contracting business. Hosted by New York Times bestselling author and contracting business expert Weldon Long, “Cracking the Code” regularly features EGIA Contractor University’s industry-acclaimed faculty and helps viewers discover timeless proven strategies and emerging best practices that are being implemented today by the country’s most successful contractors. EGIA members enjoy the added benefit of on-demand access to the full archive of all previous episodes. 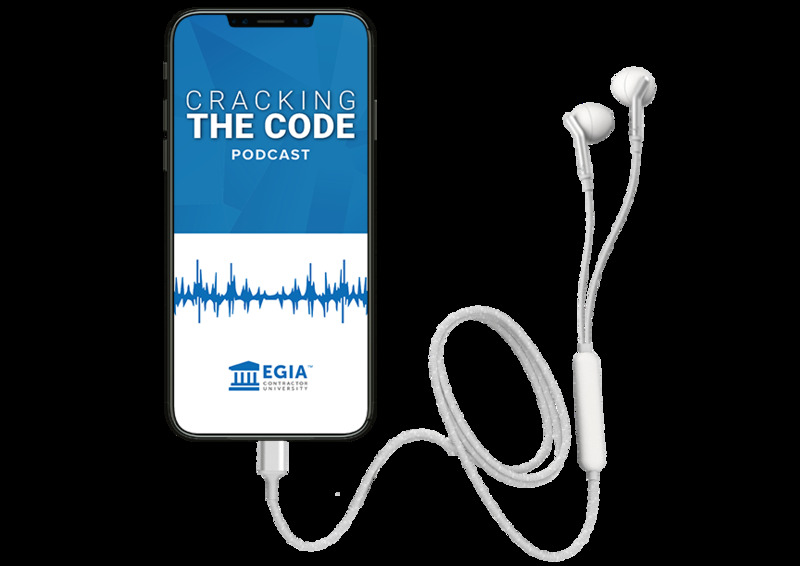 Twice a month, the EGIA Contractor University podcast addresses best practices, industry research, listener questions and more, all in a concise, entertaining package. The podcast mixes advice and roadmaps to success from industry veterans with wit, wisdom and humor, creating a truly can’t-miss first-of-its-kind in the industry. Do you have a challenge you are facing in your business and want advice from other contractors who are in your same shoes? 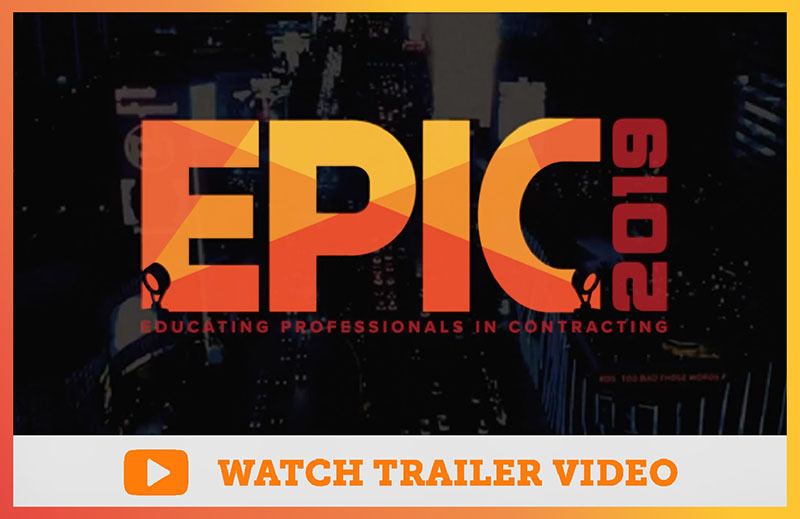 Are you interested in an easy and convenient way to network and connect with contractors and leading industry consultants from across the country? 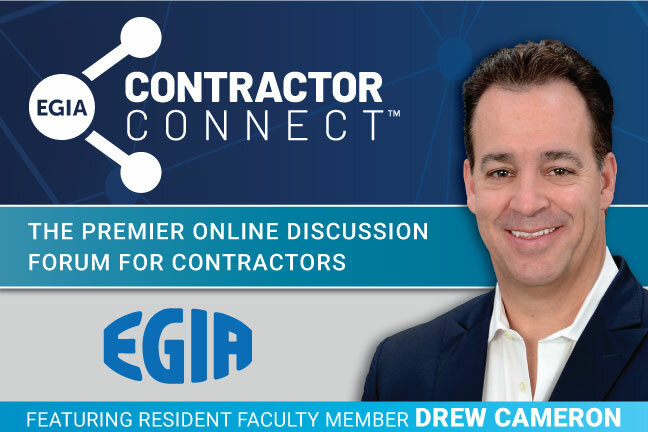 Look no further than EGIA Contractor Connect, an exclusive online forum for EGIA members that allows contractors to ask questions and share ideas with other individuals within the EGIA network, including EGIA Contractor University’s panel of experts. EGIA has negotiated special discounts with several of the premier business product, service, and training providers available today allowing members to save up to thousands of dollars on many of the essential tools needed to run their business. EGIA members have access to an industry-leading portfolio of residential and commercial financing programs that make investing in energy efficiency upgrades more affordable for their customers. EGIA routinely surveys its contractor network on specific focus topics to gain insight on how contractors are evolving their business practices to achieve maximum success and then publishes a summary of the survey results for EGIA members to access. The EGIA Foundation, a 501(c)(3) nonprofit public charitable organization committed to educating, researching and developing the next generation of qualified workers for the home service industry, is proud to announce that the EGIA Foundation Scholarship Program is now accepting applicants for the 2018-19 academic year. Up to 20 scholarships of $2,500 each will be awarded to qualified applicants who are pursuing an HVAC technology-related course of study at an approved institution during the 2018-19 academic year. Once you become an EGIA member, you’ll be assigned one of the following membership account managers (based on region) who will assist you with the onboarding process and help you maximize the value of your EGIA membership each step of the way!